Having invested in a quality garden shed, it is very important to look after it well to ensure a longevity of life by carrying out Garden shed maintenance. 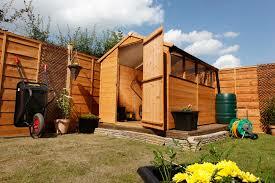 If treated and maintained correctly you should be able to enjoy your shed for many years to come. Treat your shed with a preservation treatment at regular intervals to get the longest possible life out of your shed. Wait for a spell of good weather to treat your shed. Difficult in the UK we know! A vital part of Garden shed maintenance is keeping an eye on the roof felt. Roof felt on sheds generally lasts about five years – after this time replacing felt will help ensure your shed remains watertight. Check the felt on your shed’s roof regularly and patch up or replace it if you notice any holes or tears, normally caused by storms, falling branches or animals. Quick action is essential to avoid your shed becoming damp and potentially causing damage to contents. It is also useful to check inside your shed for any holes, leaks or evidence of damp. A good time to check is after or during a period of rainfall so you will be able to easily spot leaks. Again, fix any holes as quickly as possible to avoid your shed becoming damp and at risk of rotting. The right base can ensure your shed lasts as long as possible – making time to construct a sturdy, dry base when building your shed will help it last for many years to come. Regularly check that your base is still level and cannot become waterlogged, both of which could cause the shed to warp, rot and eventually collapse. Also ensure no soil has come into contact with the timber, as this could also cause problems with damp and rot.